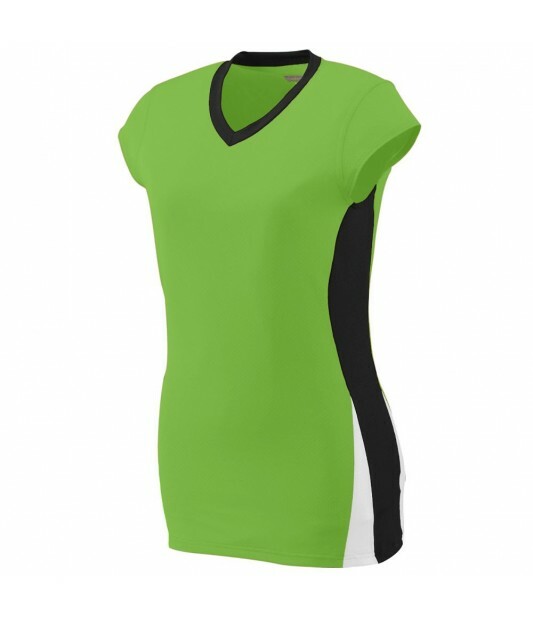 The GIRLS' HIT JERSEY is sure to be a hit on the field. The contrasting side panel with white triangular insert at hem creates a sleek, slimming silhouette for a fashionable choice in activewear. The polyester and spandex wicking pinhole mesh draws moisture away from the body to keep you cool and dry through the most rigorous practices. The contrasting V-neck color adds extra flair and a feminine fit with room for movement, while the slightly longer length provides worry-free coverage when arms are raised. The double-needle hemmed sleeves and bottom will stand up to wear and tear and help you roll with the punches on the field or the court.